Conjugation is a key attribute of many organic materials (e.g. 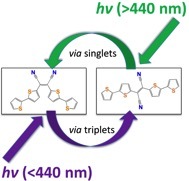 photovoltaics and photoswitches) and there is continued interest in tailoring conjugated moieties and their interactions in order to control their photoresponses. A critical step in this direction is to understand relationships between structure at the intra- and intermolecular levels and photoinduced behaviors (dynamics). In this talk we present our efforts to illuminate structural properties and dynamics of excited states in conjugated materials as well as structure-dynamics relationships that underlie their photoresponsive behaviors. 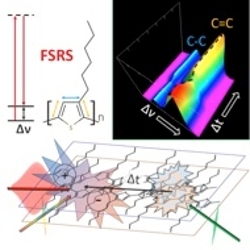 Experimentally we utilize femtosecond stimulated Raman spectroscopy in combination with time-resolved electronic spectroscopies to interrogate variations in local structure and delocalization and to probe nuclear dynamics induced by excitation. We present work with poly- and oligothiophenes demonstrating that ultrafast evolution in excited-state conformation and exciton localization can be tracked through time-dependence in Raman frequencies and in mode-specific resonance enhancements (bottom left). We further illustrate that resonance enhancement enables photoselectivity for interrogating the nature of various structural motifs that support localized excited and charge-separated states in aggregated materials (center). 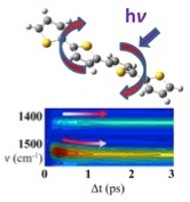 Finally we describe multiplicity-specific, isomer-dependent switching mechanisms in thiophene-based photoswitches (right); the role of multiexcitonic states in switch activation and implications for photoswitch design are discussed. Dr. Art Bragg is an Assistant Professor of Chemistry at Johns Hopkins University. He is a graduate of Albion College and completed his graduate studies in Chemistry at UC Berkeley in the group of Prof. Daniel Neumark. Dr. Bragg conducted post-doctoral research in the group of Prof. Benjamin Schwartz at UCLA. He joined the Chemistry faculty at JHU in 2010 and has built a research group focused on fundamental ultrafast spectroscopy and dynamics that underlie the photoresponsive behaviors of conjugated and plasmonic nanoparticle systems with material applications. Research topics of current interest in his group include: nonadiabatic photochemical bond formation and molecular photoswitching; dynamics of multiple exciton generation in organic materials; structure and dynamics of excited state localization in conjugated polymers; charge transfer in hybrid and assembled organic materials; and the photophysics and charge-transfer in plasmonic (metallic) nanomaterials.